Looking at the bright side. TV&apos;s late-night talk show hosts weighed in on Republican candidate Donald Trump winning the U.S. presidential election, and their reactions ranged from somber to playing it for laughs on Wednesday, November 9. Watch what they said in Us Weekly&apos;s video roundup above! British import James Corden shared a story with Late Late Show viewers about when he told his son almost two years ago that the family was moving to America. "He looked at us — I&apos;ll never forget it — he went, &apos;Daddy, that&apos;s great.&apos; He was 3 and a half, but somehow he knew intrinsically that this was a fantastic place to live," Corden said. "It&apos;s a country of opportunity and diversity and hope, and that will never change." He advised viewers that no matter who people voted for, "Now is the time more than ever to remember our values. … It&apos;s the tone you set that will define who we are. So treat people with love and respect. Go out and put your arm around someone, even if you hate their politics. Tell them that you care." Conan O&apos;Brien admitted that it was "a really strange day," telling the audience that "half the country is really happy, half the country is somewhere between despondent and furious" after Trump&apos;s win over Democratic candidate Hillary Clinton less than 24 hours earlier. Reminding viewers that the country has had "bitter, angry elections for 200 years," the history buff continued, "In America, we get to choose who&apos;s going to ruin our country, and it&apos;s a privilege." Jimmy Kimmel expressed the sentiments of many when he said, "The good news is that the election is over. It&apos;s done." 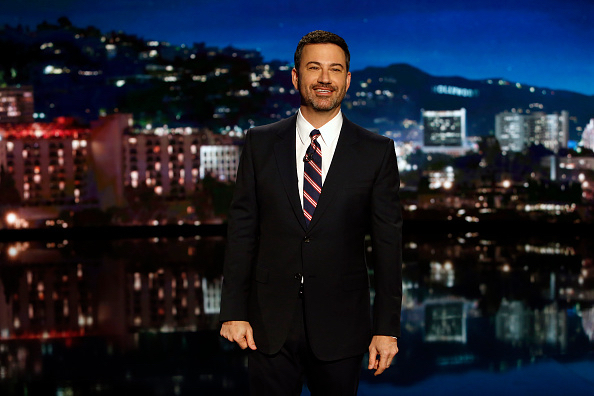 After suggesting that Trump was surprised by his win and doesn&apos;t actually want to be president and would rather play golf, Kimmel pondered what the future would hold for those political figures we&apos;ve gotten to know so well over the past 18 months, showing a video roll call featuring Trump&apos;s wife, Melania, who "has no idea what&apos;s going on"; New Jersey governor Chris Christie, who Kimmel predicted will be a tollbooth collector on the George Washington Bridge; Ken Bone, the still-undecided new face of the L.L. Bean Holiday catalog; Trump supporter Scott Baio, who the host joked will star in Sharknado 5: Sharks in Charge; and more including Billy Bush, former NYC mayor Rudy Giuliani, the Trump kids, former President Bill Clinton, vice president–elect Mike Pence, and former presidential candidates Bernie Sanders, Ben Carson, Ted Cruz and Jeb Bush. Seth Meyers told his Late Night audience that he felt for parents with daughters who had to explain what had happened this morning. "A lot of them, like me, probably thought Hillary would be our first woman president, but she won&apos;t be," the Saturday Night Live alum said. "But that does mean that someone&apos;s daughter is out there, right now, who will one day have that title." Meyers got emotional as he spoke about how his mother, whose name is Hilary, was so excited about a possible Clinton win, and told the future first female president, "Whoever you are, I hope I live to see your inauguration." Full Frontal&apos;s Samantha Bee opened with a segment that showed her dreaming of a different outcome as she excitedly high-fived people, including Stephen Colbert, Larry Wilmore and Jon Stewart, and declared "It&apos;s over!" before she woke up in a panic whispering, "Oh, no!" "How did everyone get this so spectacularly wrong?" the Canadian-born host asked viewers, suggesting it might have been her fault because she voted in a U.S. election for the first time "and I broke America." "America is still a great country and it is still worth fighting for," Bee added. "It has Shonda Rhimes&apos; shows, and peanut butter and Beyoncé and Lin-Manuel Miranda rap-weeping at award shows, and it has the beautiful U.S. Constitution, which we should probably start teaching in schools."